Hollander Development Corporation (HDC) is a leader in creating affordable, sustainable apartment communities for families and seniors throughout Michigan. Since its formation in 1979, HDC has developed more than 4,000 homes using innovative financing strategies including tax credits, specialty loans, government programs and private dollars. 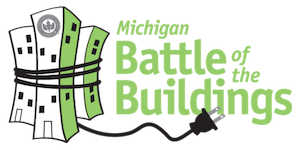 This is Hollander Development Corporation’s second year competing in the Michigan Battle of the Buildings. In the 2015 competition, HDC’s Valley View III took first place in the “Multifamily” category, with a reduction of 8.44 percent. This year, HDC’s Gateway Village of Sturgis won second place in this category, with a reduction of 12.98 percent. Pictured from left to right: Cheri Holman-USGBC West MI, Matthew Hollander-Hollander Development. Gateway Village was a multimillion-dollar rehabilitation project of an existing, 1970s-era affordable housing complex. In addition to making many much-needed cosmetic and convenience updates, HDC teamed up with Inform Architecture and Wolverine Building Group taking a holistic approach to energy and water conservation. The project included a before-and-after Home Energy Rating System (HERS) analysis; full conversion to LED lighting; improvements to building envelope (insulation, windows, doors, etc. ); upgrades to HVAC systems; new appliances; and resident education. HDC is engaged in new construction, rehabilitation and ongoing operation of a variety of building types. For new construction projects the baseline is to achieve a minimum performance threshold of LEED Gold or equivalent, with the goal of adding LEED Platinum and Living Buildings to its portfolio. HDC’s most recent rehabilitation projects have focused on aggressive energy conservation measures and onsite renewables, adhering to Enterprise Green Communities criteria. The developer committed to certify Gateway Village to Enterprise Green Communities, targeting 30-plus additional points beyond the mandatory criteria. “Many of our “extra” points are focused on energy efficiency and we are conducting post-build HERS testing to validate our assumptions,” says HDC Principal Matthew Hollander. HDC takes a holistic approach to all energy related projects, balancing building envelope improvements with advanced technologies such as LEDs and high efficiency HVAC equipment. “This was in full effect at Gateway Village,” says Hollander. Consulting engineers from Byce & Associates reduced the size of Gateway’s new boilers after considering improvements made to air sealing and insulation, enabling HDC to upgrade to much higher efficiency equipment at no additional cost. HDC used Multifamily Green financing from Fannie Mae to borrow at better rates, based on its aggressive energy conservation measures. Cinnaire Corporation, HDC’s financial partner, originated the loan and brought private Low Income Housing Tax Credit equity to the project.